The teacher Cristian, who gave me today's on online school engoo.com, grew up in New Jersey. Here are some facts which I learned during the class. New Jersey is a green State with beautiful landscapes. It is the most densely populated of the 50 United States. Tourists like this state for its location. It is close to New York and the State has zero percent tax for clothes. Tax exemptions include most food items for at-home preparation, medications, most clothing, footwear, and disposable paper products for use in the home. It makes sense for New Yorkers to come for shopping to New Jersey because of the tax for clothes in New York 15 percent. Cristian mentioned the amusing park. Six Flags Great Adventure in Jackson Township is the world's largest theme park. The Kingda Ka is the world's tallest rollercoaster. I asked the teacher about the medical system in the USA. How would I feel if I was the ordinary citizen of the US with less than the average income in case of necessity to apply to the hospital? The teacher answered, "Say goodbye to all your savings". If a mother, who is going to give birth her child, doesn't have insurance, the cost of one night in the hospital could be 2000$! 8000$ for three nights is the usual price ... Wow ! But if you have the insurance, you would pay 2000$ in a year and in that case the person doesn't make additional payments for being in the hospital. For calling an ambulance car for delivering to the hospital the price would be from 200$. Back to New Jersey. Here are the cliffs of New Jersey overlook the Hudson River. 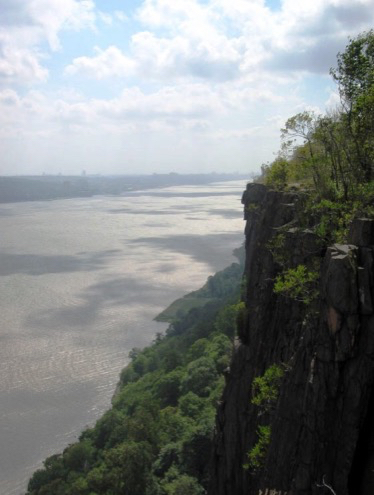 Most of the people link the Hudson River with New York city but it has natural shores with green trees.